Take a look at any professional football game, basketball game, or marathon starting line, and you’re bound to see them: compression wear. Tight sleeves, knee-high socks, full-length leggings in neon colors that seem to be on nearly every competitor. The claims on compression gear are impressive: Manufacturers say compression garments can speed recovery, increase blood flow, and therefore, improve athletic performance. But what about in motocross? I have used compression type garments in the past with great results. Is it actually working or is it a placebo effect? Honestly I can’t sit here and tell you the science behind all of that, but I can tell you what I feel when riding with Seven’s new Zero Compression Pant. Seven MX has introduced their Zero Compression Pant, that is an athletic compression fit, that is said to hold muscles tight and help reduce unnecessary muscle movement or shaking, that can result in loss of energy. Seven also claims that muscle compression also promotes blood and oxygen flow which aids in quicker muscle recovery, allowing for muscles to work at a higher rate for longer periods of time. The Zero pants feature a moisture wicking performance material that is said to pull moisture away from the body to keep you cool and dry. Stretch mesh panels in the bodies high heat zones is said to help to regulate body temperature. Seven also incorporates silicone dot gripper tech print in key areas for added grip on knee braces and inner pant liner. Ok, so now that you know a little about the product, how does it work on my old motocross carcass of a body? I will tell you that some of these claims that compression wear helps blood flow are found to be true for myself. Having some type of compression on my limbs (while I workout or ride) seems to help lessen muscle fatigue (for myself) and also keeps things held together nicely when I am out pounding motos. The Zero Compression Pants fit snugly and acts like a thin layer of support for my legs. I like the fact that my knee braces do not slip throughout the day due to Seven’s silicon dot gripper material. 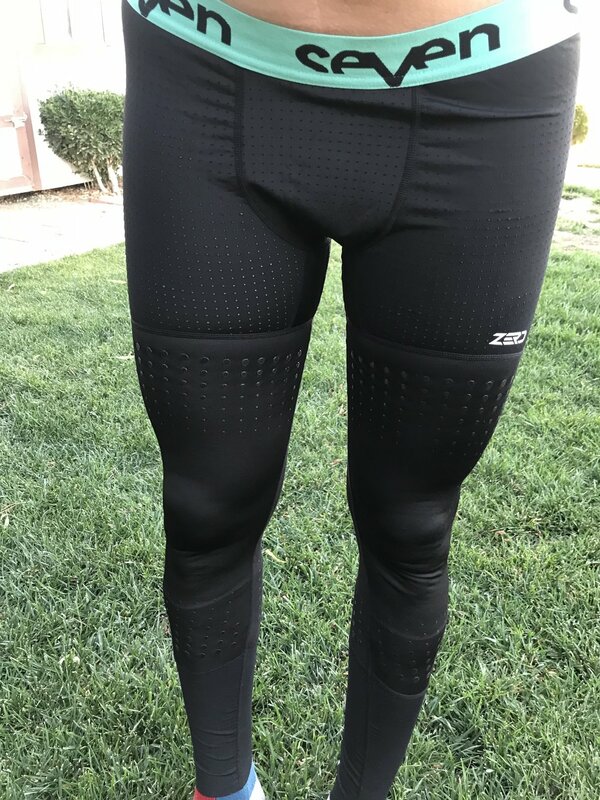 The Zero Compression Pants are also thin enough that they don’t heat up my legs on a hot desert day and can actually cool them down when I start to sweat. The biggest benefit, that I have felt, is that my legs do feel a little more secure and fresh at the end of a long test day. Is it the compression? Is it a placebo effect? I don’t know, but to me it doesn't matter because it helps my legs feel fresher and more secure if you will. If you don't like wearing long motorcycle knee brace socks then having some type of compression pant under your riding gear is a must. I usually wear a Leatt or Asterisk knee brace pant, but I have been resorting to the Seven Zero Compression Pants because it’s simply less material to deal with. Although I do like that the Zero Compression Pants do not allow your knee braces to slide down, the Leatt and Asterisk pants do make it easier to put your riding pants on (due to the fact that the Asterisk and Leatt compression pants fold over your knee braces, which doesn't allow the velcro straps, of your knee braces, to get hung up on your riding pant liner). If you haven't tried compression type products yet and are old like me, maybe give these Seven Zero Compression Pants a try. They aren't some miracle pant, but they do feel nice under your riding gear, helps your legs stay fresh, keeps your legs cool, and secures your knee braces without having to have excess material. The Zero Compression Pants are $89.00 for adults (S-XXL) and $80.00 in Youth (Y24-Y28) sizes.